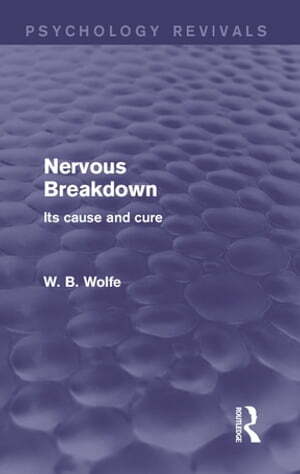 Collins Booksellers - Nervous Breakdown (Psychology Revivals) by W. B. Wolfe, 9781317396659. Buy this book online. Originally published in 1934, excerpts from the original preface read: "A Nervous breakdown is a terrifying experience. When it occurs, the patient, his family, and often his friends are panic-stricken. No one knows just what to do with the patient, and the patient is incapable of helping himself. … What should be done? If you think you have a nervous breakdown, it is your first duty to consult a competent and reputable physician, preferably your family doctor, and get a thorough and complete physical examination. If you cannot find any evidence of physical or organic disease, ask your doctor to recommend a reputable psychiatrist or medical psychologist. …This is a compact manual of help and self-help." Today this book can be read and enjoyed in its historical context.